Maybe Salt Isn't So Bad After All? Even since I switched to an unprocessed foodstyle (about 2 years ago), I have become more and more excited about cooking. I can’t stand bland food, so I use herbs and spices like crazy! There is nothing wrong with using spices to prepare your food! Not sure why people believe that eating healthy sometimes means eating bland (e.g., steamed plain veggies, plain chicken breasts). Yes, you do need to avoid sauces and mixtures or powders that are actually made from multiple ingredients. But, you can easily find the pure spices in the spice section of the supermarket by reading the labels to see what they include. Pure spices are just the spice or herb. Just double-check on the label to make sure. Sometimes I have to buy the organic version of a spice to get a pure spice. Also, you can grow your own herbs or buy them fresh (e.g., basil, oregano, parsley), which is best. Then you know for certain what is in it. Let’s move on to the topic of salt. Why have we been told for decades to avoid salt? The old conventional wisdom was to reduce your salt intake, to improve blood pressure and cardiovascular health. But, if you are eating natural foods that you prepare yourself (e.g., pure meats and veggies), adding your own salt will already be drastically reduced from the amount you find in any processed food. Avoid processed foods, salt your own natural foods to taste, and you will get the amount of salt you need. You actually do need salt. A study published in the Journal of the American Medical Association (May 4, 2011) assessed blood pressure in relationship to a sensitive measure of sodium intake. The study lasted eight years and included more than 3,500 healthy people. Salt intake was not related to a diagnosis of hypertension. What’s more, people consuming the least sodium were most likely to die from cardiovascular complications. A recent meta-analysis of 167 experimental studies found that reducing sodium had a modest impact on blood pressure (American Journal of Hypertension online, Nov. 9, 2011). There were negative effects, however. 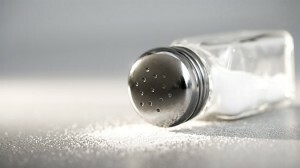 People on low-salt regimens had higher levels of cholesterol and triglycerides, as well as stress hormones such as adrenaline, renin and aldosterone. Elevations in these hormones might undo the benefits of sodium restriction.